Marshall University President Jerome A. Gilbert today announced alumnus and Intuit Chairman and CEO Brad D. Smith and his wife, Alys Smith, have made a $25 million gift to the university’s Lewis College of Business. Gilbert said the Smiths’ gift—one of the largest in Marshall’s history—is “transformational” and will provide new and dynamic opportunities for current and future business students. In announcing the gift, Gilbert said the university is proud of its alumni, like Smith, who have built outstanding careers with the education they received at Marshall. Brad Smith, who graduated from Marshall in 1986 with a bachelor’s degree in business administration, said he and his wife are enthusiastic about aiding the school and its students through continued education and academic expansion. Dr. Avinandan “Avi” Mukherjee, dean of the Lewis College of Business, said the gift will allow Marshall to rework its business curriculum and build new facilities. Mukherjee said the location of the new business building will be announced at a later date. In recognition of the Smiths’ gift, the college of business also will name its undergraduate and graduate schools the Brad D. Smith Undergraduate School of Business and the Brad D. Smith Graduate School of Business, respectively. The Smiths previously established the Brad D. and Alys Smith Family Scholarship at Marshall for West Virginia and Ohio students, with preference for first-generation college students. Their past support was recognized by the Marshall University Foundation Board of Directors in 2015, when the board named the foundation’s building the Brad D. Smith Foundation Hall. Brad Smith has been intimately involved in a number of Marshall projects over the years, including 2017’s Design for Delight challenge, which included Intuit leaders visiting Huntington to help Marshall students create business plans. The program culminated in a competition judged by Smith, actress and West Virginia native Jennifer Garner, and former Marshall and NFL quarterback Chad Pennington. Dr. Ron Area, chief executive officer of the Marshall University Foundation, said he hopes the Smiths’ leadership gift inspires others. Brad Smith, who has led Silicon Valley software giant Intuit for 11 years, and Alys Smith, an attorney, live in California. They have two daughters, Payton and Devon. Brad Smith was born in Huntington and grew up in the nearby town of Kenova. After graduating from Marshall in 1986, he received his Master of Business Administration degree from Aquinas College in Michigan. Alys Smith graduated from The Ohio State University with a Bachelor of Arts in biology and then graduated with a law degree from the University of Akron School of Law. During Brad Smith’s tenure as CEO, Intuit has grown and thrived, while consistently being recognized as one of the world’s best places to work. Intuit has placed on the Fortune Best Companies to Work For list each year, ranking #13 in the United States in 2017, as well as being ranked the #1 best place to work in India, Singapore and Canada in 2017. He is ranked among the top executives in the United States by Fortune, coming in at #6 on their list of top CEOs. In 2011, he was inducted into the Lewis College of Business Hall of Fame. He was inducted into West Virginia’s Business Hall of Fame earlier this year. Marshall’s Lewis College of Business is among only one percent of business schools worldwide to be accredited in both business and accounting by AACSB International. The college boasts more than 12,000 alumni around the world. 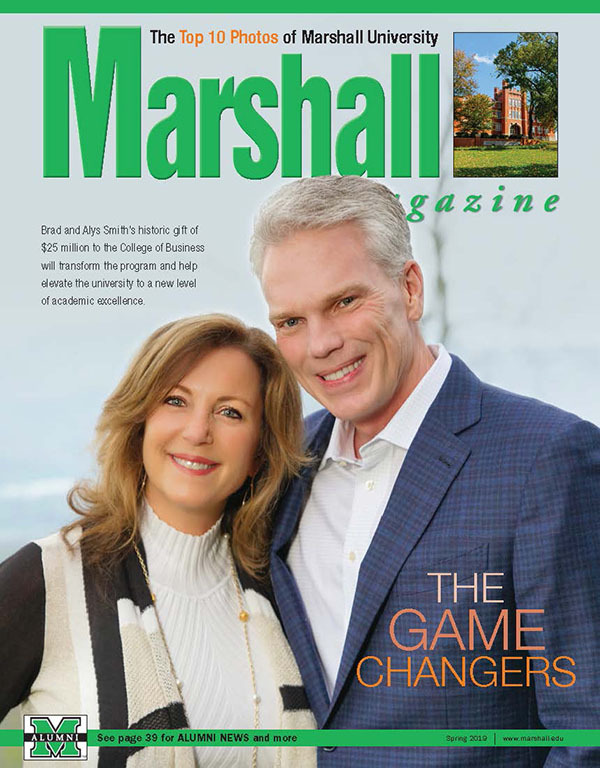 Photo: Marshall University has announced that alumnus and Intuit Chairman and CEO Brad D. Smith and his wife, Alys Smith, have made a $25 million gift to the university’s Lewis College of Business. Photo courtesy of the Smith family.